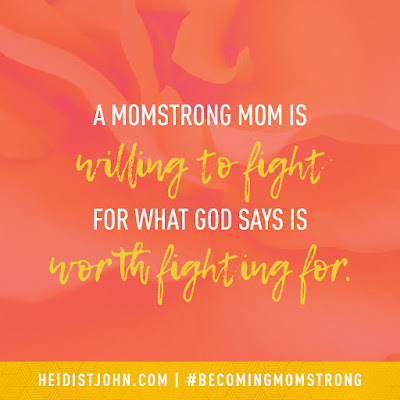 Heidi St. John's book, Becoming Mom Strong, is a call-to-arms for Christian Moms everywhere! The subtitle of the book is "How to fight with all that's in you for your family and your faith." Being a warrior isn't the first image that comes to mind when we picture motherhood. Motherhood usually invokes images of white ruffly gowns, baby snuggles, rocking chairs, and a soft glowing light. Some moms find themselves invoking their warrior mom early, as babies born with serious health conditions find them fighting for their child's life immediately. 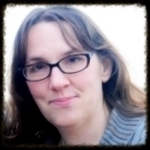 Some are warrior moms as their battle with postpartum depression rears it head. Some of us find ourselves getting along just fine, managing to do things on our own strength for a long time, until we find ourselves exhausted, burned out and overwhelmed. 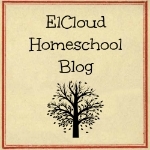 At that point, we are discouraged as our children's misbehavior and the constant, everyday parenting struggles and monotonous mountain of chores start to seem pointless. We feel as if it's never going to end and we aren't making a difference. The devil has found our weak point, he's caught us relying on our own strength and not God's strength. Eventually, our children grow up, and we are burdened to pray for them as they make life-changing decisions and as they face the difficulties of life on their own. It's too late to undo our past parenting choices. They're on their own now, and all we can do is pray. 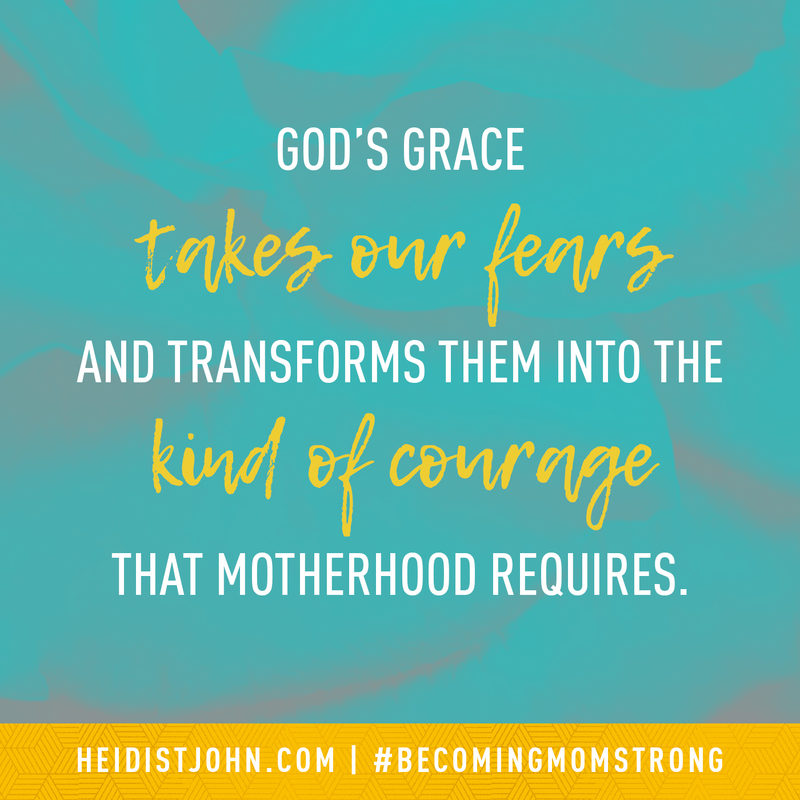 In Becoming Mom Strong, Heidi St. John challenges us to always go to God's Word as our measuring stick for truth. She reminds us that we are fighting a battle against spiritual forces that lie to us, and to our children. We are fighting a culture that wants to distract us and destroy our faith in God, and wants to steal our children. This battle is so important and we can't let ourselves become discouraged and give up. The majority of the book was a confirmation of the very things God has been laying on my heart. It was affirmation that what I'm doing is important and reminders to keep finding my strength in God's Word and to seek His presence daily. But when I got to chapter twelve, I broke out my highlighter. I cried. Because I have felt burned out. I have felt overwhelmed. With children ranging from preschool through young adulthood, I am facing a wide variety of spiritual needs and difficult behavior. It can be so tiring and I've found myself "checking out" at times. Heidi reminded me that I can not check out. This is a battle. I must be a warrior mom. Because nothing else is worth fighting for as much as the hearts and faith of my children. 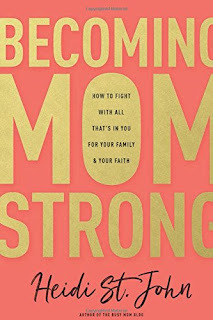 I know this book can bless every mother, but I feel like it's essential for the moms whose children are ten and above. Once our children reach the age of ten, they're bombarded with so many more messages from society, and they're beginning to question things. They're making their faith their own, and wading through so many mixed messages. But we can't give our children what we don't have. We have to be strong in our faith, sure of what we believe, if we are going to be able to pass that faith on to our children. They need to see us living it ourselves. They need to see us in God's Word, praying, turning to Him for answers. 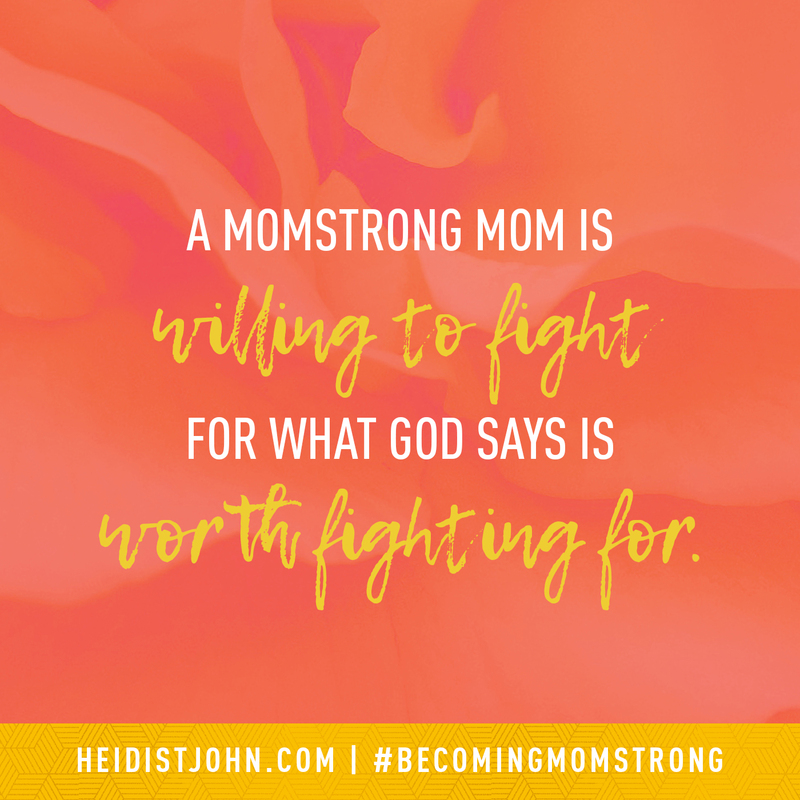 We have to be Mom Strong to lead them and to fight for them. 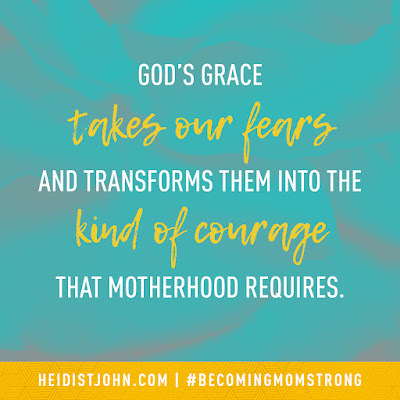 Becoming Mom Strong is inspiring, courage-building, and I'm looking forward to digging into the accompanying Bible Study now that I've finished the book. 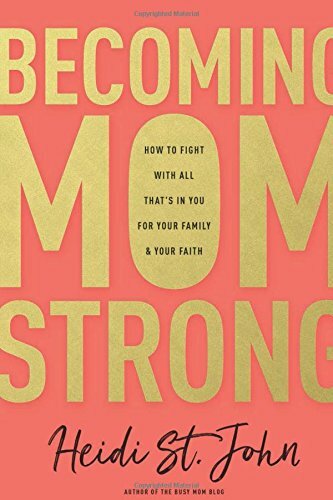 I recommend it for all Christian Moms.